Areas popular with tourists and social drinkers are often pretty—well—smelly. Massive quantities of garbage, loud crowds and late-night acts of public urination can make party neighborhoods feel pretty unlivable. One interest group in the Hamburg red-light district of St. Pauli has a solution: walls that pee back. Coated in hydrophobic paint, the walls send that steady stream of urine right back toward the perpetrators’ legs and/or feet. Because, if the streets are going to smell of urine, then so is the pee-happy partier. St. Pauli hosts around 20 million visitors each year—that’s twice as many as visit New Orleans’ French Quarter—and the vibrant tourism industry is a large part of what defines and supports the neighborhood. Like most such neighborhoods, people do actually live and work there, which makes it less than pleasant to wake up and find your front door, or sidewalk, or playground covered in pee. Previously, St. Pauli has tried to enact prohibitions and fines, but these measures simply haven’t worked. This brings us to the St. Pauli Peeback program. Interessengemeinschaft St. Pauli (IG St. Pauli) represents businesses in the area, and having got completely fed up with the problem, they decided to spray a layer of super-hydrophic oleophobic nano-coating onto walls. This makes the walls completely water- and pee-proof, meaning that while the sidewalks may still end up with a stinky coat of pee, so will the perpetrator. Some of the pee-proof areas are posted with signs, warning a would-be pisser of their risk, but the folks behind the project warn that not all the walls coated in the paint identified. It’s probably better to just hold it in. Areas popular with tourists and social drinkers are often pretty—well—smelly. Massive quantities of garbage, loud crowds and late-night acts of public urination can make party neighborhoods feel pretty unlivable. One interest group in the Hamburg red-light district of St. Pauli has a solution: walls that pee back. Coated in hydrophobic paint, the walls send that steady stream of urine right back toward the perpetrators' legs and/or feet. 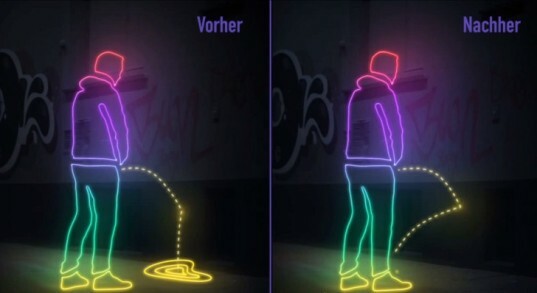 Because, if the streets are going to smell of urine, then so is the pee-happy partier.